ALavandhAr enjoys emperumAn‘s presence along with pirAtti (SrI mahAlakshmi) on the lap of thiruvananthAzhwAn (AdhiSEshan) which is explained in paryanka vidhyA. thayA sahAsInam – bhagavAn accepts service along with SrI mahAlakshmi in nithya vibhUthi (paramapadham) as said in Siva [linga] purANam “vaikuNtE thu parE lOkE SriyA sArdham jagathpathi: | AsthE vishNurachithyAthmA bhakthair bhAgavathais saha||” (The inconceivable lord of the universe, vishNu, mercifully resides along with SrI mahAlakshmi, in the supreme abode, SrI vaikuNtam, along with bhkathas (devotees) and bhAgavthas (his followers). Even during his incarnation [as SrI rAma], same principle is applied as said in SrI rAmAyaNam ayOdhyA kANdam 31.25 lakshmaNa says “bhavAmsthu saha vaidhEhyA …” (While you enjoy with sIthA, I will serve you both in all ways). 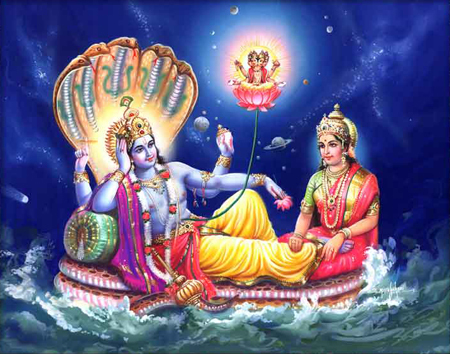 anantha bhOgini – Like Sriya:pathithvam (being the lord of SrI mahAlakshmi) gives him greatness, his togetherness with AdhiSEshan too is an aspect which highlights his greatness. He is known as anantha (endless) due to having endless qualities as said in “gandharvApsarasas sidhdhAs sakinnaramahOragA: | nAntham guNAnAm gachchanthi thEnAnanthO’yamuchyathE ||” (The limit of his qualities is not reached by gandharvas (celestial singers), apsaras (celestial damsels), kinnaras (celestial musicians), mahAnAgas (another type of celestial beings) and sidhdhas (yOgis). This is why he is known as anantha). ISvara has innumerable qualities to protect all; AdhiSEsha has innumerable qualities to serve ISvara. bhOgini – in the divine body which which naturally has tenderness, coolness, fragrance etc. bhOga – body. prakrushta vigyAna balaika dhAmani – One who is being the abode of the divine couple, matching their gyAnam (knowledge), Sakthi (strength) etc. One who has the ability to bear the playful sports of the divine couple, on him. paNA maNi … – One who is having the divine private quarters in his middle part (lap) which is lit by the collections of precious stones on his hoods. As said in mudhal thiruvanthAdhi 53 “maNi viLakkAm” (the shining lamp), precious stones on his hoods are the auspicious lamp. This entry was posted in Other, sthOthra rathnam on January 22, 2017 by Sarathy Thothathri.